Coaches are frequently consumed with their own self-anointed routines, content to stay within their scripted behavioral paradigms. If you think you might be one of those coaches, here’s a suggestion: Next time your team plays, arrive at the bench with a commitment to “listen” to the match. In my experience, the match has a lot to say to you. Here’s an example from my coaching career: My team was down 2 sets to none, and my players were leaving the court to attend the traditional mid-match meeting. We needed to find a way to climb back into contention. As my staff paused in the outer hall before going inside the locker room, they were steaming with anger. They wanted me to come down hard on the team for playing so poorly, but I asked them to hold off. I had been watching our players enter the meeting. There were no slumping shoulders, no staring at shoe tops. They had played with great effort over the last 20 minutes of the match, but they just couldn’t score points with any regularity. I saw no quit in their eyes as they filed into the meeting room. Everyone seemed to be on task. So I chose to create a calm, business-like approach for the meeting. I treated the situation as if it were an explanation of a practice drill. My message was calm and brief. There would be no wholesale tactical changes, no personnel changes. In fact, I told them I was proud of the way they had held their mental ground in the match. I told them that the necessary ingredients to launch a comeback were within reach. I told them to be patient and to play with an inner calmness that had been missing up to that point. I only spoke for about a minute, then walked back to the bench area with my staff. I felt a strong sense of confidence in how I handled the meeting. I had coached in almost 2,000 matches. I had learned how to listen to what the match was telling me. I was hearing loud and clear that my team still had plenty of fuel in the tank. Two hours later, in front of a sell-out crowd of nearly 6,000 people and a live TV audience, my players melted into a victory pile in the middle of the court. This affirmed what I had learned from experience: if you “listen,” you can discover just about everything you need to know. Of course, the way I’m defining listening here includes observation, too. It’s a combination of using your eyes and ears to get a true feel for what is happening with your team as the match unfolds. Watch your setters more than any other player – their body language, their presentation of themselves toward teammates. This is often the litmus test for how your team is adjusting to the match. Scan the body language of each player immediately following an error. This will tell you who is fully engaged and who isn’t. This is often the time when players or coaches vent. Don’t do it yourself, and look carefully to see if your players are doing it. Listen, literally, to your team while they are playing. Who’s doing most of the talking? I sometimes close my eyes momentarily and listen. I want to know who’s engaged and who’s dishing out mindless chatter. Observe how the opposing coach behaves when his or her team has made uncharacteristic mistakes. Has player trust in their coach broken down? Notice how your players greet subs as they enter the game. This can reflect the team’s level of confidence in this player. There’s no limit to what can be discovered when one zooms in to hear what the match is saying. What you decide to do about what you learn is another matter that requires a different set of decisions, but your starting point has to be developing an awareness that the match has a lot to say. Everything you “hear” has a bearing on the match. It may produce a confirmation of what you have already observed. It may provide an opportunity. It may require you to make a decision that involves a change. 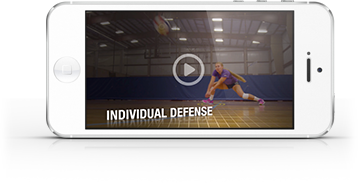 Whatever occurs, the consistent tracking of the emotional ebb and flow of your team will help you gauge how to help your players, and that will give your team a better chance to play its best volleyball. Mike Hebert is a retired college volleyball coach who coached at Pittsburgh, New Mexico, Illinois and, most recently, Minnesota. He guided the Gophers to a Big Ten championship in 2002 and 3 NCAA final four appearances (2003, 2004, 2009). His Illinois team won 4 Big Ten championships and reached the final four twice: 1987 and 1988.